Alternate title for this blog: All Work and No Play Makes Sarah TERRIFICALLY SPIRITLESS. Fantastically devoid, if you will. So no new blogs, no, not as of right this moment. Sorry, Friends. I am working on it, trying to figure out a better life for myself, trying to piece things together. Speaking of which…guess who made it home all in one piece? Ms. Whitney! All the way back from Korea! Here are some final thoughts from her whirlwind 6-week sojourn in the Far East. South Korea, if you will. I was blessed with a childhood full of outdoor activities and opportunities to observe Nature’s facilities with unlimited wonder. My appreciation for such an upbringing grows with every new outdoor adventure, and our weekend trips to Seoraksan National Park and Jeju Island provided just such growth. 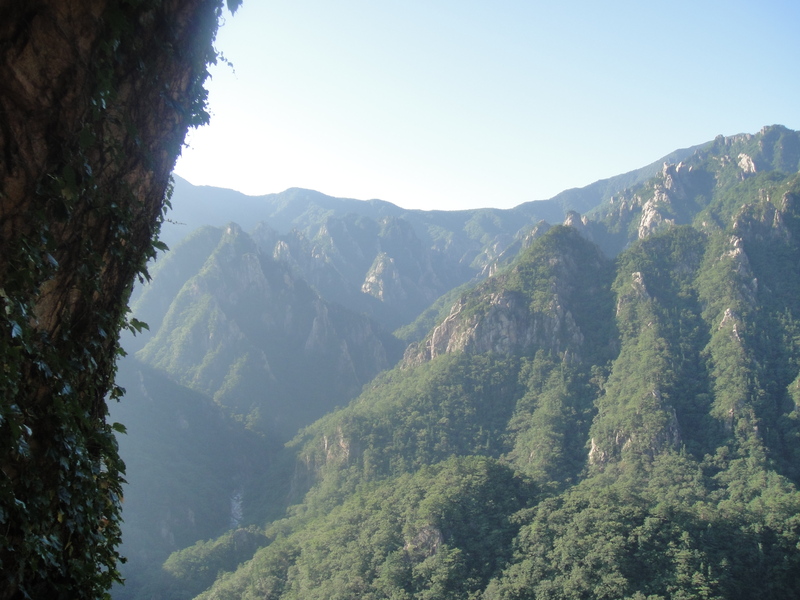 The nostalgia of my outdoorsy childhood aside (the smell of the woods in Eastern Asia reminded me of that in the woods of the Eastern US), let me tell you a little bit about our excursions. Tim is an excellent planner. Over the last six weeks, when I wasn’t occupied with one of the many entertainment items he assigned to my Anti-Boredom drawer (the contents of which included books, spa kits, a dart board, an Etch-A-Sketch and more things for me to play with while he was at work), I was busy enjoying the fruits of his travel planning. When we found out that our tour to Seoraksan was canceled, he decided that we could go it alone. He found out which bus to take (and which bus to take after that), got us a reservation at the best hotel in the park (technically, the only hotel within the park), and one early Saturday morning, we were on our way! It’s a little something what I call Vacation Determination. Taking the bus turned out to be pretty easy. 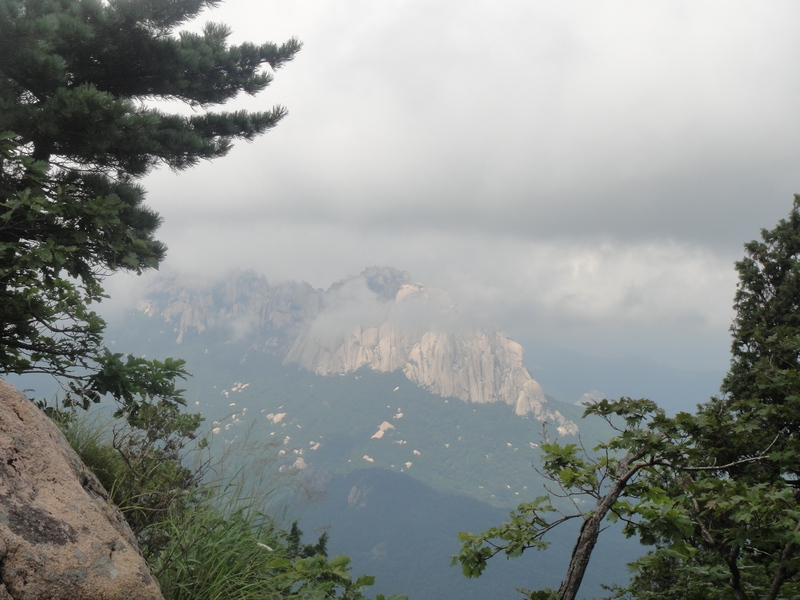 From Songtan (located south of Seoul on the western side of the peninsula), we got a bus to GangNeung on the eastern side of the peninsula – about a four-hour trip. In GangNeung, we caught a bus for an hour-long ride to Sokcho, right on the coast of the East Sea (The Sea of Japan to most non-Koreans), and then rented a car. The rental turned out to be the trickiest part, since we were experts in the fundamentals of Charades but still far from proficient with Hangul (the Korean language) and we couldn’t find the section about renting a car in the guidebook. The rental agents were helpful and perseverant, however, and within an hour, they had us on the road heading for the mountains in a Hyundai. This peak is not the tallest in the park but is said to be the face of it. From the other pictures, you’ll see that most of the mountains, where they aren’t covered in trees, are very rocky with many jagged edges. The smoothness of Ulsanbawi really struck me with its contrast to the crags on the other mountains. Up we went! Along the path to Ulsanbawi, there is a giant boulder that rests in such a position that, if you push it in just the right place, it will rock back and forth: named Rocking Rock (or Waggling Rock, as I also saw on signs). After watching a monk from the nearby cave-temple demonstrate where to push on the rock, Tim got it to wiggle just a little bit (click here for video). That’s the fun part – the funny part is that, even though people can get it to move, no one can move it enough to knock it over; thousands have tried to push it down from its perch and none have succeeded! Quite a famous rock. Moving on! 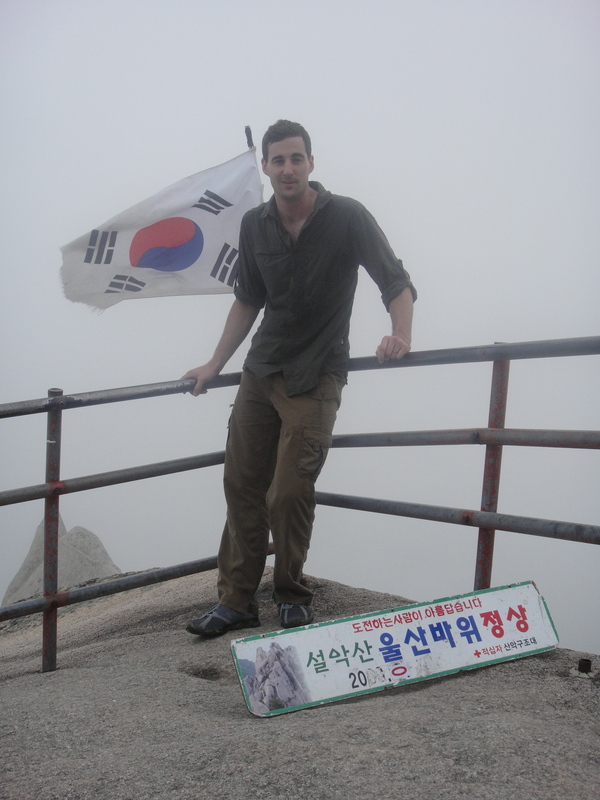 We reached the base of the summit, after a fairly good climb into the clouds, and had a mighty good climb ahead. 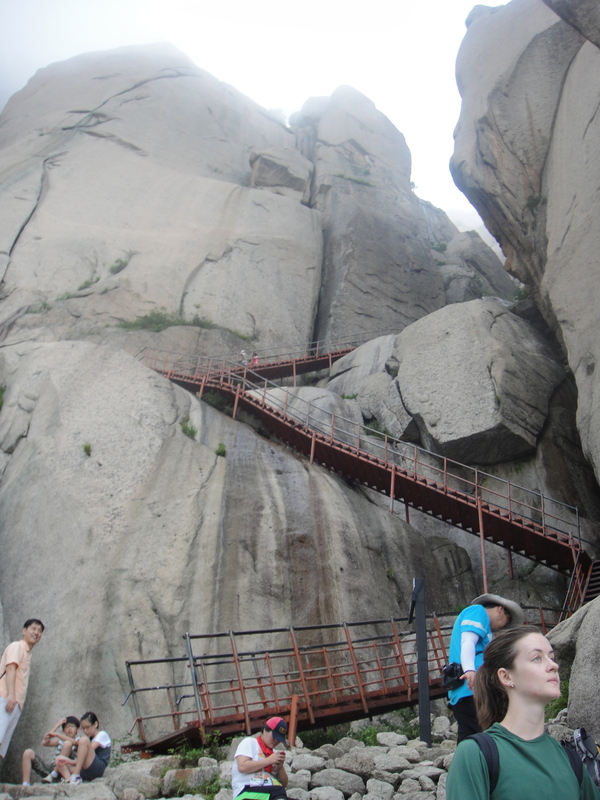 From here, locals say there are 888 stairs to the top of the peak, though I only counted 699. (When I was a kid, my mom told me that every stair you climb is enough exercise to gain you one extra second of life. So we added at least a dozen minutes to our lives with this summit!) A combination of metal staircases cemented into the rock and a path over boulders brought us to the top of the mountain where we saw nothing but fog. We were disappointed not to have a view (we took a picture of a picture showing what we would have seen on a sunny day), but appreciated the fog for its eerie factor and for keepin’ things cool. It was a climb of 873 meters (about 3,000 feet), and we had gotten up early for the bus, so after descending we showered, dined, and zonked in preparation for another early morning. The next day we left the hotel at 6:30am, just in time for us to beat the throngs of day visitors to the trails. Heading for a cave in the cliffs of another mountain, we took a trail through the woods, over some beautiful pools of clear blue water, and up another rocky hillside to another set of crazy stairs. How anyone ever found this cave, I can’t imagine (not true, my guess is that is was rock-climbing monks). 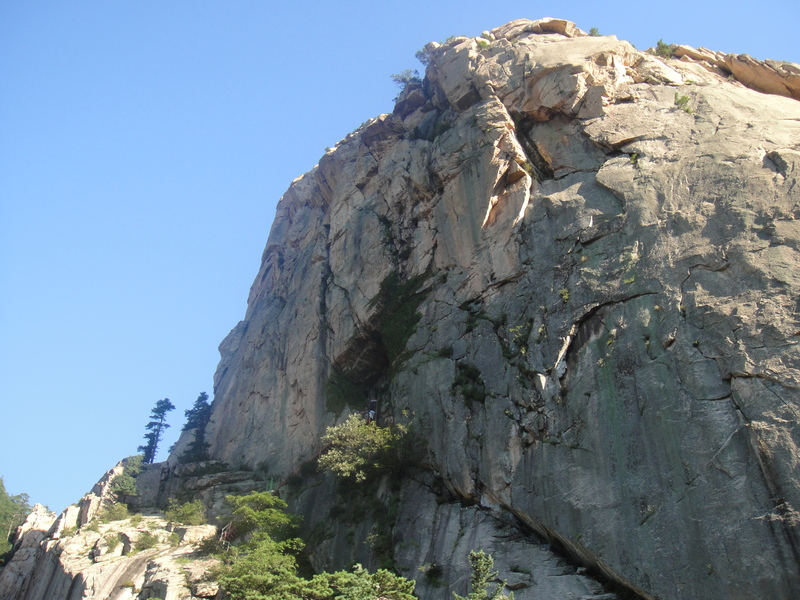 It was set so high in such a vertical wall that some of the “steps” carved into the rock were about two feet tall. We reached the top, peaked into the small temple inside the cave, and had a sip of water from the spring running down the wall. The clerk at the hotel desk told us that the more water you drink from this spring, the longer you will live, but, he added, don’t drink too much, or you’ll get diarrhea. The last thing we saw at the park was the view from the tram-gondola-cable car (they are called so many things! But it was just like the one in Juneau, so I’m calling it a tram). It carried us up yet another mountain and from there we climbed to the top of the rocks. And whaddya know, the fog rolls in! We had had sunshine all morning and somewhat regretted taking on Ulsanbawi on the cloudy day before, but had enjoyed the next morning’s sun until it was time for the clouds again. Oh well. They rolled in and out and we got the best views we could, made more valuable by the weather. On the way down, I got stung on the thigh by a giant bumblebee while boarding the tram. I was wearing jeans! I felt the sting and in my frantic effort to get at whatever had caused it (I couldn’t see the bee at the time), I may have even poked myself with the stinger a second time. Is that possible? Because it definitely looked like there were two prick-points. Ouch. Tim had the idea of buying a bag of ice cream and using it as an ice pack, which was brilliant (see my earlier post on Korean Snacks). I iced it as we drove back to Sokcho. After turning in the rental car, we walked around the coast of the East Sea for a little bit, then caught a bus back to GangNeung, and were back in Songtan by 10pm. A whirlwind trip, but that’s been the name of our game for a while now! 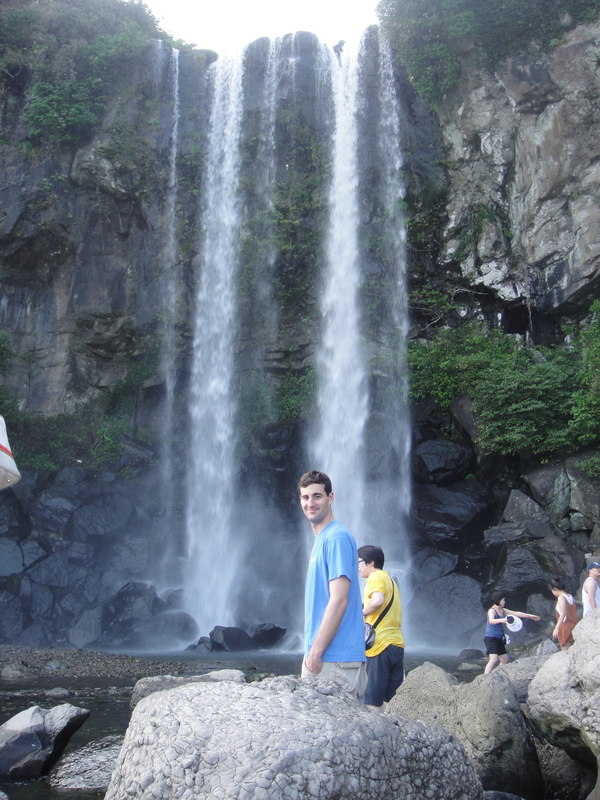 For our stay in Jeju, we had a little bit more time but plenty to see. 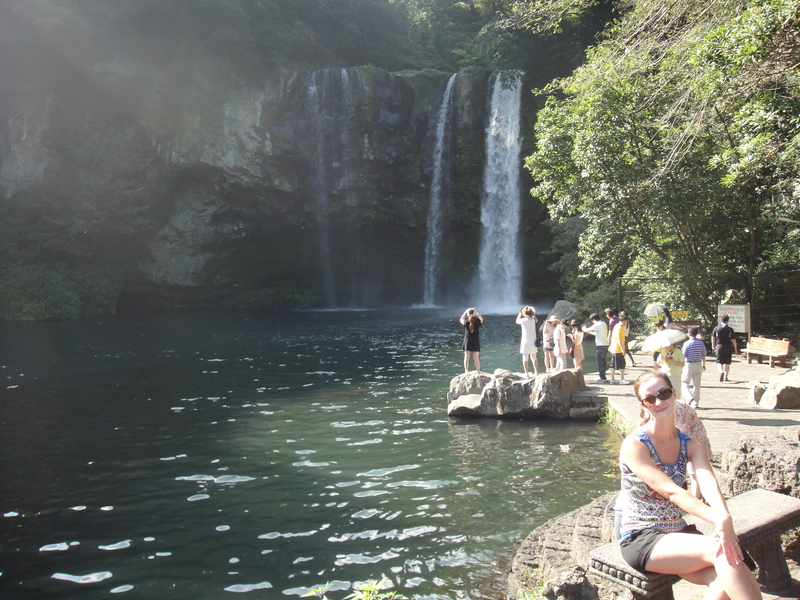 Jeju is a volcanic island to the south of Korea, about the size of South Carolina, and the top honeymoon destination for Korean newlyweds. Indicated on most official maps as “Jeju Special Self-Governing Province”, we think that its status with South Korea may be similar to Puerto Rico’s relationship with the US… that is, it’s part of a ruling country but also doing its own thing. Research is needed here. In any case, we booked an itinerary for a package deal that included airfare and two nights at a five-star hotel with the on-base travel agency, and saw the sites. We arrived Saturday at noon and rented a car. The process here was mysterious: the rental agency seemed to be located in a parking lot at the airport, and was one of about 30 other agencies in that parking lot. Each company had its own van that functioned as an office and 6-10 parking spots each. So we waited for about an hour for our reserved-ahead-of-time car to be brought to us – as they didn’t have room in the parking lot for all of the reserved cars, it seemed like they had to go get our car once they realized we were there. The dumbest part: we had to pay a parking fee to exit the parking lot! It was less than a dollar, but still, really? You’re going to have a van as your office, with enough room for one customer to sit and wait out of the heat (air conditioning made possible by keeping the van running all day), while everyone who can’t fit in the van stands in the sun while you go out of the parking lot, retrieve cars, take them to get washed as everyone waits, still in the sun, then send us out with a parking fee? I’m not indignant here, I just really don’t see how that process makes sense. So, we drove to the hotel (which was very nice but for the looped track of ten songs that played on high volume all day in the garden), dropped off our things, went in search of sushi (then gave up and just went in search of lunch), and then drove to see waterfalls. Jeongbang Waterfall: Not good for jumping because the rocks, although volcanic and possibly full of air holes, are not fluffy. The next day we were planning to hike Hallasan, the tallest mountain on the island and an extinct volcano. 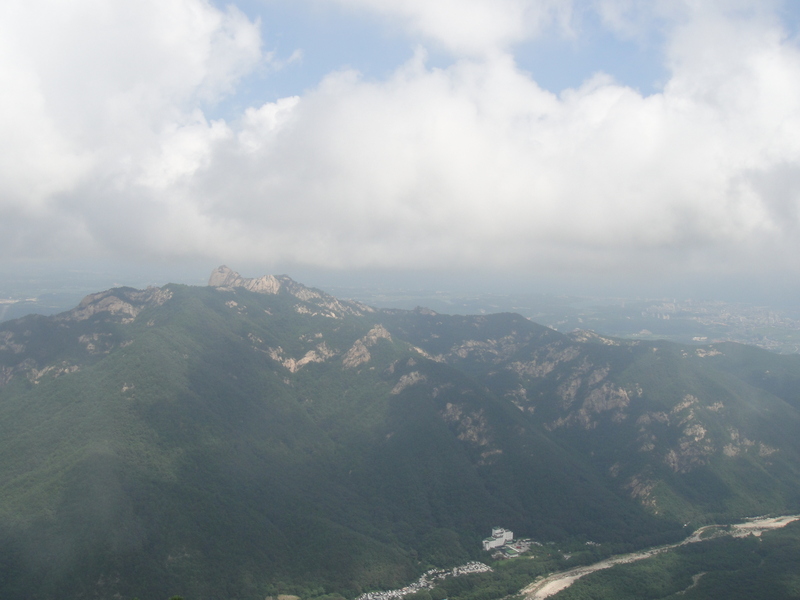 It is also the tallest mountain in South Korea, measuring 1,950 meters tall (almost 6,400 feet). We woke up at 8am, having read that the trail we would take to hike the mountain didn’t open until 9:30am. We found out upon our arrival that you actually have to get there before 9:30am, or else they won’t let you ascend the summit. We had gotten there at about 10:40 and were pretty dismayed at the news. However, we learned that the trail opens at 5:30am, so we decided to switch Sunday’s itinerary with Monday’s and save the mountain for the following day. So our new plan for the day included lava tubes and a hydromagmatic crater-island-thing! 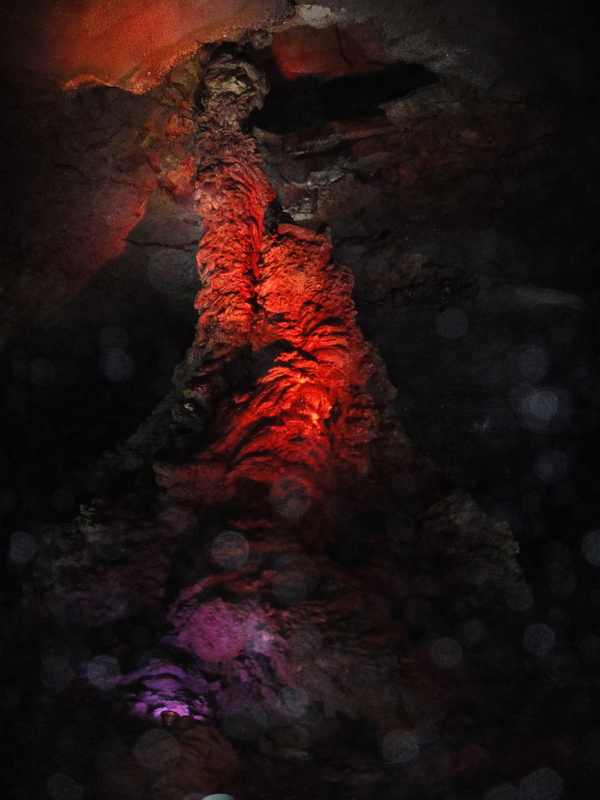 We went to Manjanggul, one of the largest lava tubes in the world and home to the largest lava column in the world (a lava stalagmite, if you will, formed when cooling lava flows off of a ledge and piles up. It’s like when you make a mud-drip castle at the beach). 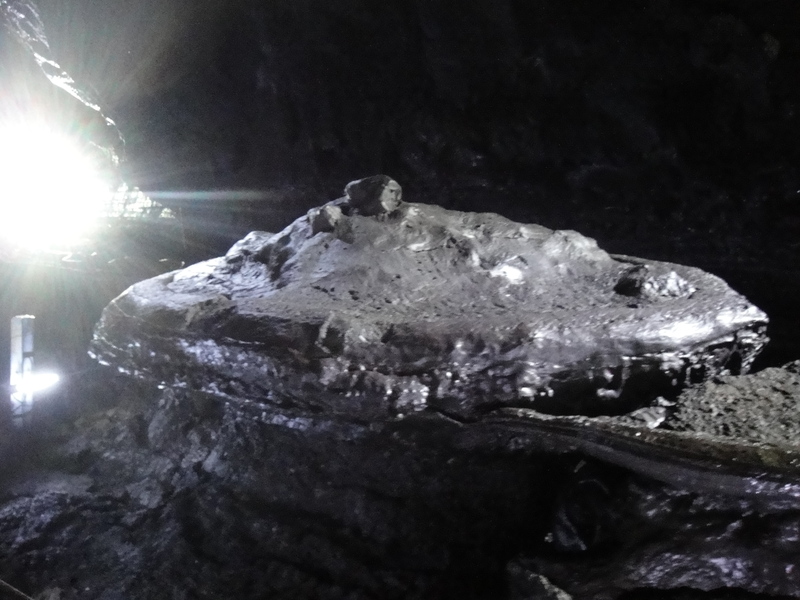 It was chilly and dark inside as we walked one kilometer underground from the public entrance to the lava column. There is a rock formation, called a lava raft, that they named “Turtle Rock”, which is noticeably shaped just like the island of Jeju! Fun and interesting, it made me wish I knew more about geology. Largest lava column in the world! Lighting also available in blue, green, purple and yellow. After Manjanggul, we drove to Seongsan Ilchubong, or Sunrise Peak. It is a large vertical volcanic formation that rose out of the water thousands of years ago whose edges form rims to a giant crater in the center. Narrowly connected to the mainland of Jeju, it is located on the easternmost point of the island and is therefore the first to see sunlight every morning, hence its name. We climbed the steps to the top, along with a few hundred other tourists, took in the views, and took pictures until my camera battery died. 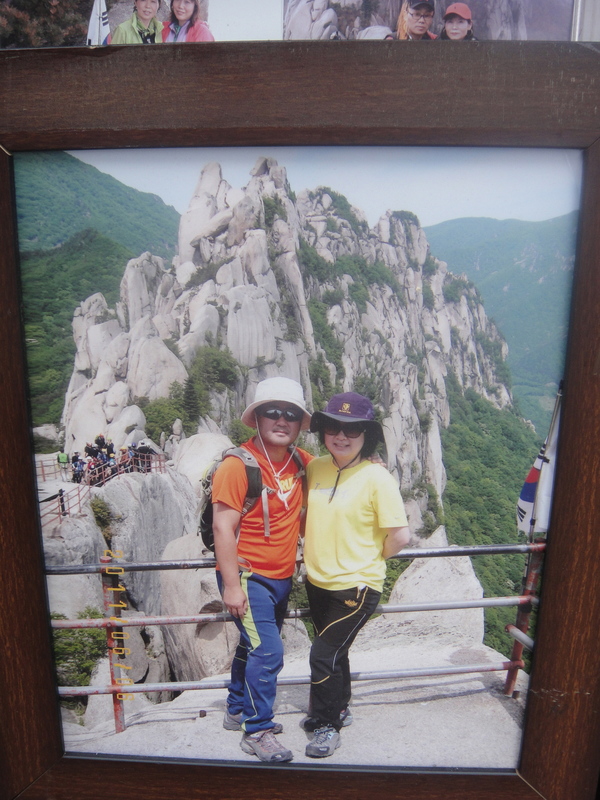 All of these excursions, the waterfalls, the cave, this peak, cost 2,000 won: about two dollars per adult. We laughed to realize, however, that the youth/child prices applied to those up to age 24, so Tim was technically deserving of the discount at 24, while I was the adult at 25! It’s funny how in the US youth prices stop for those over age 12; many other countries extend the favor to young people well into their twenties, whether they’re a student or not. 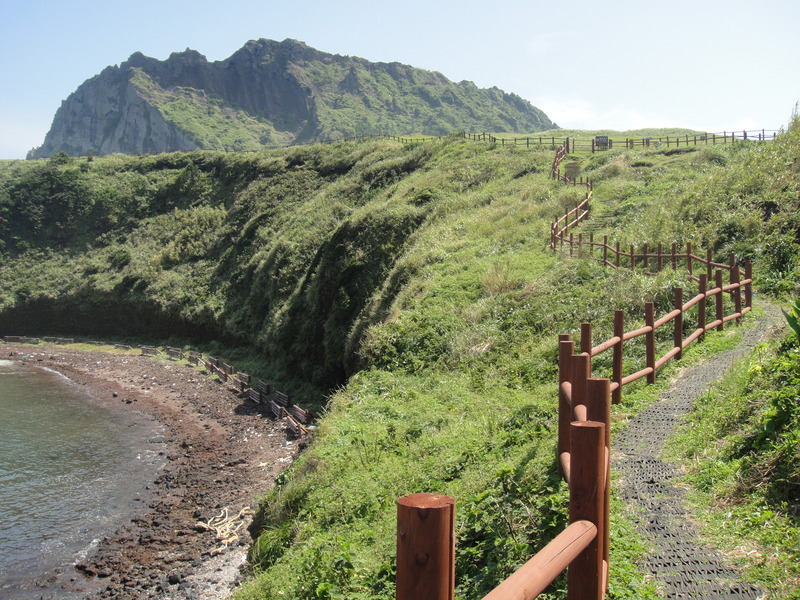 Our last day in Jeju was great for hiking Hallasan. We woke up at 4am and checked out of the hotel, then drove to the park in order to hit the trailhead at 5:30. The insanely early start was necessary because our flight left that afternoon at 5pm, and it turned out to be quite worth it. The only bummer about being the first hikers on the trail was that we caught a bunch of new spider webs in our faces. I took to waving a stick out in front of me to try and take them down before accidentally eating them. Besides that minor nuisance, there were only two other hikers on the trail with us as we climbed to the top, so it was very peaceful. 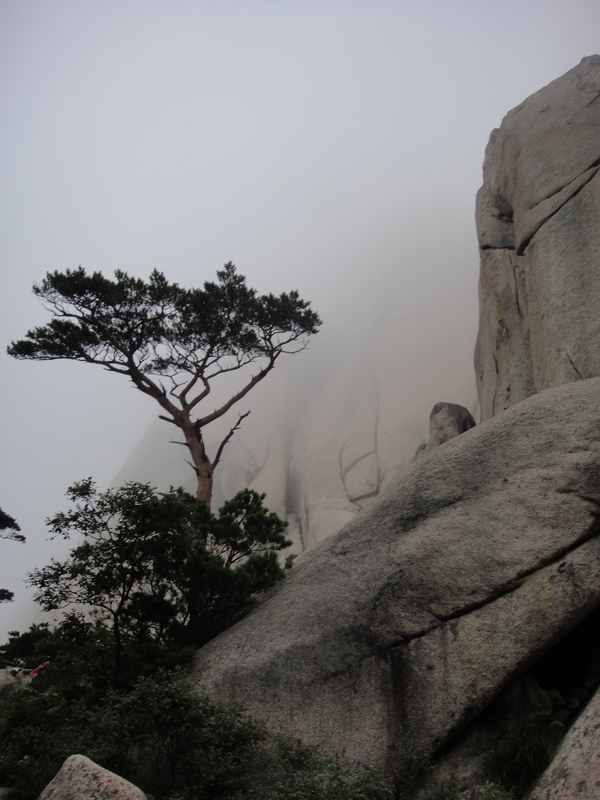 We were worried that, like in Seoraksan, we would have such low cloud cover that we wouldn’t have any views at the top, and as we walked, the reason for such worry increased. It was foggy here too! The first two hours of the hike were first in the dark, then in the clouds, so we braced ourselves for the worst, but finally, during the last 45 minutes or so, we started to get some sunshine. It was so wonderful to have a view at the top, and the extra warmth was greatly appreciated. Atop Hallasan: A lake in a crater on the peak! The clouds didn't leave us alone entirely, but we were thankful for the views they granted. On the way to the summit we only saw two other hikers, but on the way down the trail, we saw over 400! Yes, I counted. It was so good that we went early. It took us three hours to get to the top but just as long to get down because the trail was so rocky and because of all of the people we were passing! In any case, we made it to the airport in time to check in the car and grab some lunch, then made our flight back to Korea just fine. The sites we visited in Seoraksan and Jeju were crowded, and I noticed two distinct types of visitors. The first were clad in all the designated gear for ascending a serious mountain: synthetic fabric shirts (often in blazing bright colors), swishy pants, hiking boots, hiking gloves, bandannas, hats, scarves, packs… all of it in pristine condition (so did they really need such serious clothes if they weren’t doing much hiking that would create some wear&tear?). Then there was the other end of the spectrum: those dressed as though they had hit the trails just after shopping at the mall. Women in heeled sandals or silly little shoes were everywhere, and they seemed so unprepared for the terrain! But because there were so many of them, they must not have thought their choice of footwear would be regarded as careless. These two versions of ill-equipped and well-equipped hikers was baffling! Overall, despite the crowdedness, people were very friendly and welcoming on our trips. Many offered to take our picture for us while others wanted to know where we were from, and though I found the attention and questions a little embarrassing, they seemed genuine. It was nice to visit such friendly places. Maybe we’ll be back for the Olympics in 2018!